DIY Your Robot! Stepper Motor/Servo/Motor/Sensors/IR Romote Full function Motor HAT Robot Expansion Board for Raspberry Pi 3B+|3B|2B|B+|Zero. 4 H-Bridges: TB6612 chipset provides 1.2A per bridge (3A peak) with thermal shutdown protection, internal kickback protection diodes. Can run motors on 5VDC to 12VDC. Up to 4 bi-directional DC motors with individual 8-bit speed selection; Up to 2 stepper motors (unipolar or bipolar) with single coil, double coil, interleaved or micro-stepping; Up to 4 Channel 12-bit PWM/Servo(5V). One Infrared Receiver(GPIO26) with Big terminal block connectors to easily hook up wires (18-26AWG) and power, Polarity protected 2-pin terminal block and jumper to connect external 5-12VDC power. This Raspberry Pi Motor HAT Full function Robot Expansion Board has been update on October 31st 2018. We accept the customer advice and make some adjust of this board.It is more convenient to use now. Let your robotic dreams come true with the new DC+Stepper Motor HAT. 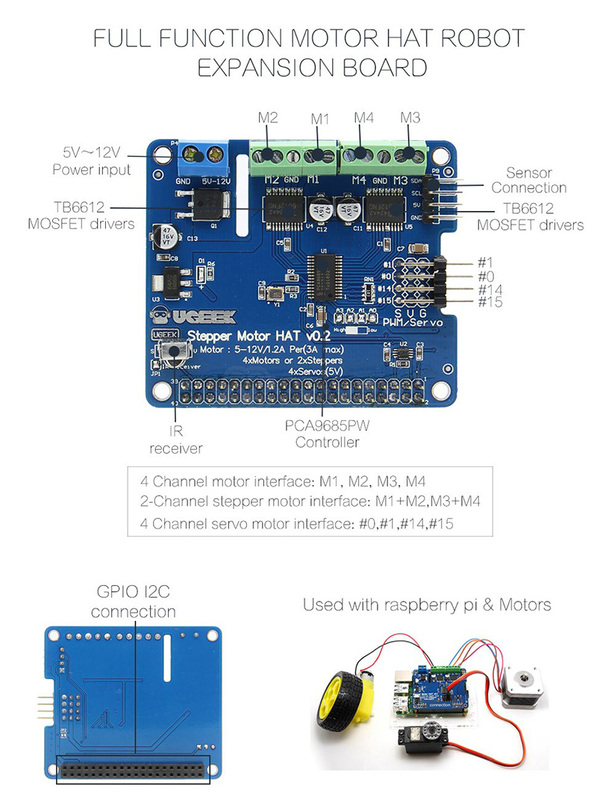 This Raspberry Pi add-on is perfect for any motion project as it can drive up to 4 DC or 2 Stepper motors with full PWM speed control, It also adds the capability to control 4 Servos with perfect timing. Motors are controlled by TB6612 MOSFET drivers with 1.2A per channel and 3A peak current capability, a big improvement over L293D drivers and there are built-in flyback diodes as well.We even had a little space so we added a polarity protection FET on the power pins and a bit of prototyping area. And the HAT is assembled and tested so all you have to do is solder on the included 2x20 plain header and the terminal blocks. Stepper motors are great for (semi-)precise control, perfect for many robot and CNC projects. This HAT supports up to 2 stepper motors. The python library works identically for bi-polar and uni-polar motors. Running a stepper is a little more intricate than running a DC motor but its still very easy. Works best with Raspberry Pi model A+, B+, raspberry Pi 2, raspberry pi 3 model b, raspberry pi 3 model b+. 1. 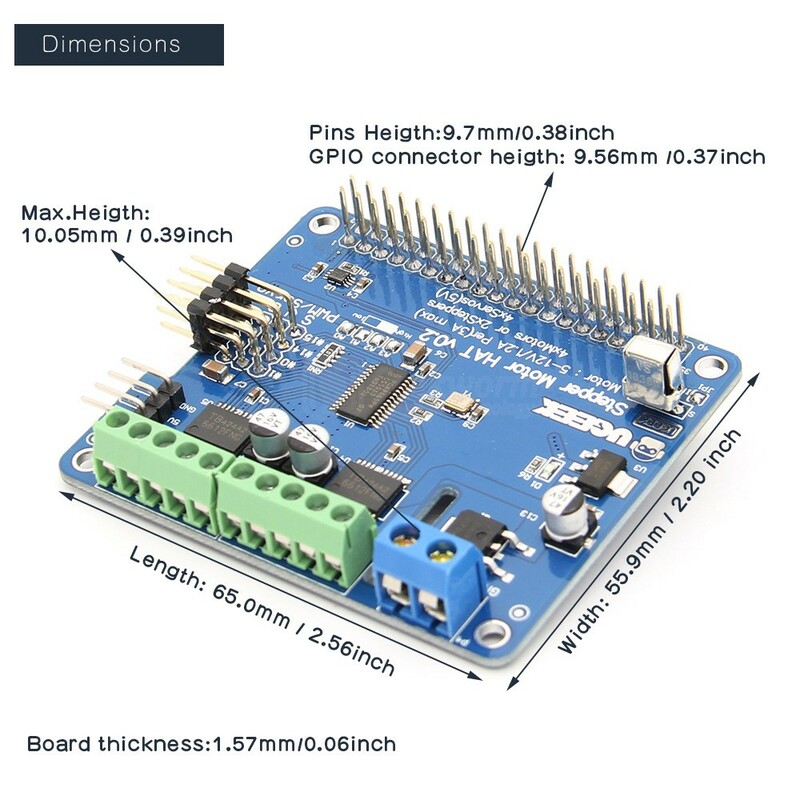 Does the board power the attached pi or will the pi require a separate power supply? Yes, the pi require a separate power supply, The Robot Expansion Board and Raspberry Pi need to be powered seperately , or the Raspberry Pi will be burned to defective. 3. How to coding for control 4 stepper motor with 4 different speed (work at the same time)? One motor hat board only have one pwm chip configuration. If you need 4 different speed, you need to use 4 motor hat boards, and each board configure with different speed. But we do not test it, you need to test it yourself, thank you!